As I promised, I will share what we think will be the hot new stone from Tucson this year. I have heard that it’s the turquoise shot with bronze, which, while pretty, I believe, (and I’m not positive about this since we have only talked to two people about it) but we think it is a reconstituted block of turquoise, with bronze shot into it. I did not see any cut into stones, but did see lots blocks of it ready for cutting. Helen and I discovered this stone at The Clam Shell. (Sorry for the bad photo) This was the stone which made Helen buy me that first margarita. This was our first purchase and it had to be pretty spectacular to make Helen lose that bet! It’s brand new and comes from China. It’s called Red Creek jasper, and the colors are breathtaking. It’s yellow, with green, orange and red, or some just have subtle tones of red and green. There is hematite infused through the pieces in straight lines, which gives the stone a bit of elegant sparkle without being overpowering. 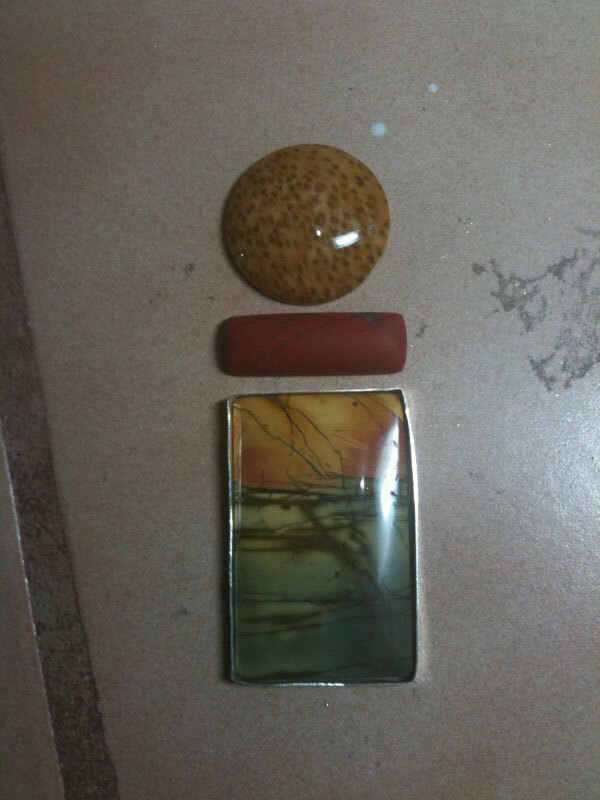 Here I have paired it with my old favorites of a round petrified palm wood and an oblong red jasper from Gary B. Wilson. It’s a work in progress, so the design may change, but I really do like this combination. Since people like jewelry with movement, I will either do tube hinges or jump ring to give it some motion. Look for this stone cut as cabochons at the Denver gem show in mid-September. I think it will greatly appeal to those who love a lot of movement and color in stones. It’s impossible for your eye to go to just one place in this stone. It promises to bring new excitement to your designs. Lovers of Picasso marble and tiffany stone will really like this one. I don’t know how large the find is, or how much will be out there on the market. All I know is it is gorgeous, and there was not a lot of rough in Tucson. I can give you no specific info about it, except the importers say it’s “not quite a jasper”, whatever that means. A new cutter for me was Jason Penn, thought I have bought his designs from The ClamShell for several years. I met Jason in Denver a couple of years ago, and what a nice man. The ones I bought this year were long marquis cuts, a black onyx and a red jasper (I can’t seem to get away from that stone), and they were sandblasted, with elegant highlighted Oriental-influenced designs of un-sandblasted area showing through. (There must be a word for this technique though it escapes me at the moment.) I see some Oriental influence creeping into my my designs, and it must be from my friend, potter Mary Sharp Davis, who we had the privilege of staying with in New Mexico, and who joined us on our adventure. Also, the day before we left for Tucson, Harold O’Connor brought some of his pieces over that had been on display in Japan. They are typical O’Connor’s, exquisite, so delicate and beautifully designed and executed. A few of these pieces can be seen at Patina Gallery, in Santa Fe, NM. Helen and I stopped by to view his new additions, and some other fabulous jewelry. Check them out. I love the excitement of a new idea, so I was awake most of last night, mind whirring with a new way to go. I’m still recovering from Tucson. The experience is both exhilarating and exhausting, but you get to talk to so many knowledgeable people, other jewelers and designers. I got to meet up with my old friend from Pennsylvania Society of Goldsmiths, and sister Lapidary Journal contributor, (and winner of one of their design awards) Maxine Rosenthal. We sat in a vendor’s RV and bought ammonite casts, laughed a lot and drank lot of water. It will take me a while to process all this. My stash of rocks on the dining room table needs to be categorized, which leads me to this subject. How do you categorize your stones? I have the glass topped Riker cases, and find those work better than the little trays with divisions, since my stones are all different shapes. Some of my friends separate by shape or color or type of stone. Now this sounds crazy, but I separate by vendor. That way, if I need another stone from a cutter to match a shape or finish of what I already have, I automatically know who I got it from. Now to some people that will make no sense. As an archaeologist, I learned to categorize pottery shards by maker/Pueblo, so I guess that’s why I do it this way. Sure, when making a multi-stonepiece I have to get out all my stones and look at them. Oh darn! It only inspires me more. So let me know what you think of our pick for the hot new stone. As soon as I find out who has it, I will let you know, but I do think Mark Lasater will have cabs of it at the Holiday Inn show in Denver in Sept.